Having Microsoft Azure host SQL Server databases on their servers is very cost-effective and efficient. Within minutes, one can have a SQL Server database hosted in the cloud and available to applications on the cloud or on premise. As with all cloud resources, and especially databases, security is a huge concern. Fortunately, SQL Azure includes features to restrict what can connect to your database server but you need to know how to use them and realize that the default settings do not protect you best. This is an important feature for cloud solutions so that only permitted sources are allowed to get data from your server and databases. You can set the IP Addresses you allow at the database level and server level. The database settings take precedence over the server settings. Cannot open server ‘ServerName’ requested by the login. Client with IP address ‘111.222.33.44’. is not allowed to access the server. To enable access, use the Windows Azure Management Portal or run sp_set_firewall_rule on the master database to create a firewall rule for this IP address or address range. It may take up to five minutes for this change to take effect. Allowing All Azure Services to Connect to Your Server is a Huge Security Hole! If you “Allow access to Azure Services” set to On, you create a huge security hole for your server and every database in it. Not only can all your resources connect to your databases, Any Azure resource from any organization can connect to your database. This setting is NOT restricted to the Azure resources in your subscription. It’d be nice to restrict permissions to the current subscription or list of subscriptions but that’s not possible. It’s everything on all of Microsoft Azure or you need to specify each IP address. To avoid the ability of rogue Azure resources from breaching your database security, you need to manually specify the IP Address of every resource that may connect to your server and databases. This can be a real pain. Microsoft Azure lets you economically and quickly host enterprise quality SQL Server databases in the cloud. The cost of each database is relatively modest. However, as you add more databases, larger databases, and/or databases that require more resources, costs increase. Providing more resources to a database is helpful when it demands it, but when users aren’t on it or during non-business hours, it may be wasted capacity. Even during business hours, one can have some databases being utilized more than others at unpredictable levels. Fortunately, Azure offers an Elastic Pool option to share resources across multiple databases. If the demand on your databases is inconsistent (spiky), you can provide a high level of capacity that’s available to the most demanding database while allowing other databases to share those abundant resources when needed. You are not charged a per database monthly fee which is great for supporting lightly used databases. Microsoft provides information on SQL Elastic Pools but does not explain how to convert existing databases to an Elastic Pool. Microsoft Azure lets you easily create and deploy enterprise quality SQL Server on the cloud and scale it to suit your application’s needs. From the SQL Server database’s Azure dashboard, you can see the Database Transaction Unit (DTU) usage against the specified DTU limit for the database. This is what we saw for usage over one hour. The cyan line across the top is the DTU limit. The dark blue line is the DTU used. The limit is what you pay, so it’s important to scale it to what the application needs. While everything seemed fine at the weekly level, looking at the hourly graph gave us a shock. It looks like the database is maxed out for most of the hour. It seems conclusive that we need to increase our DTU level. These are completely different displays of the same period of time. The 65 minute graph never hits the maximum DTU. What’s going on? 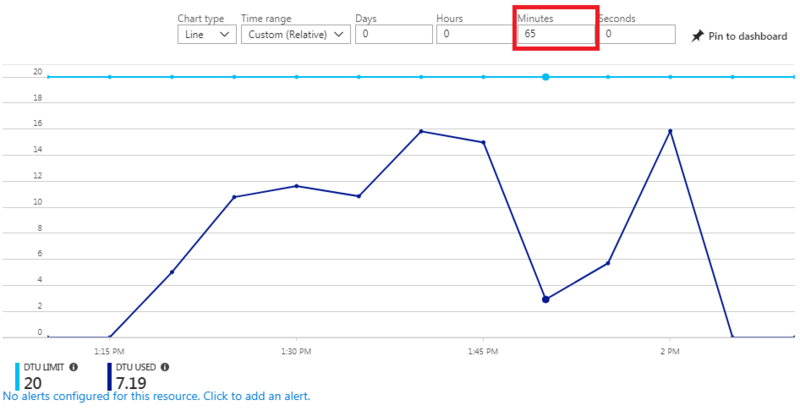 Visit our page Monitoring SQL Server Usage on Microsoft Azure and Setting DTU Limits for an explanation. TechEd is Microsoft's premier conference for IT professionals and developers. The sold-out conference took place in Orlando, Florida last week. If you didn't attend, you can still watch many of the videos from the conference, including the keynotes and other highlights from each day. Visit the TechEd web site and click the "On Demand" tab to learn about the latest in Microsoft technology. The announcements this year are stunning with huge advances in Azure, Visual Studio .NET, SkyDrive, LightSwitch, Virtual Machines, and more.